�����Big-time auctions are always greeted with much anticipation. But when a spectacular collection is sold in multiple sessions over a number of years, it can be even more exhilarating, and not just for the ultimate buyers; it also captivates those of us who are interested in the history of numismatics. �����The Stack�s Bowers Galleries and Sotheby�s hosted sale of the D. Brent Pogue Collection Part II will be complete by the time this article is published. Yet, we endeavor to report on the quality and rarity of some of these wonderful pieces of history. The quantity of coins in Part II is not really of importance; it truly is all about assembling the best quality in rarities. Toward that mission, Mr. Pogue has accomplished his pursuit above and beyond what anyone else has ever done. 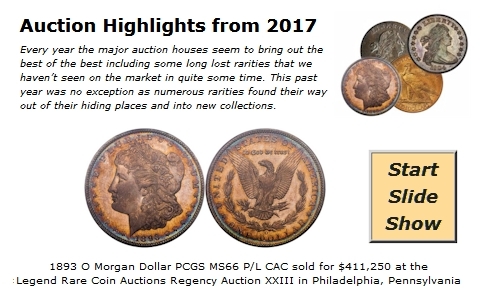 �����The Early Capped Bust Half Dollars are a phenomenal collection of high grade rarities that mostly have extremely clean surfaces under tremendous patina. Many have various hues of blues and greens and reddish browns that instantly attract the eye, and these coins have been very well preserved. Here are a few of our personal favorites below. �����While the 1817/4 Bust Half Dollar is not in the gem category, the mark-free surfaces make this coin highly desirable and its rarity will surely attract multiple bidders. This is a PCGS VF35; we have the FMV at $215,630 in VF20 and $250,000 in XF40. The only higher grade priced is in AU50 at $350,000 FMV. �����There are only two years in the short series of Flowing Hair Dollars, 1794 and 1795. But with over 160,000 coins originally minted, it would seem like there would be more coins in collector hands. Looking back at auction records, many of the Flowing Hair Dollars sold had some sort of surface problems. It is very difficult to find problem-free coins, especially for the circulated coins because of their size and the fact that they were used in commerce. Nonetheless, the Flowing Hair Dollars from the Pogue Collection do not suffer from this problem. They are all visibly attractive with each one possessing characteristics that outshine the others. �����The 1794 Flowing Hair Dollar had an original mintage of just 1,758 coins, but there are probably none finer than the Pogue PCGS MS66+ coin. Not only is it visually attractive, it also has a long provenance with some of the greatest coin collectors in history; William Strickland, Lord St. Oswald, Julian Leidman, Leon Hendrickson, and Jimmy Hayes to name a few. This coin should be the darling of this sale. Below are a few other Flowing Hair Dollars to note. �����Moving to U.S. Gold in this sale is like moving from Park Place to Boardwalk in Monopoly. These coins are consistent in quality and rarity, the only difference is the content of the coins. The Gold section of the sale begins with the Parmelee-Eliasberg 1821 $2 � Capped Head in PCGS MS66+. With nearly 6,500 coins minted there are only 18 total coins in all Mint State grades including the current listing. This is the highest certified by either PCGS or NGC and is sure to bring a world record price. At this time there is no value listed for this grade in the FMV Price Guide. Below are some of the other remarkable Gold coins in this sale. �����The Pogue Half Eagle Collection runs from 1795 to 1807 and contains some of the rarest and finest certified from the two series. There are no fewer than 15 finest known PCGS coins including the Garrett 1795 Small Eagle; this coin is graded PCGS MS65 and the current FMV is $425,000. The following list contains some of the most sought after dates in the Half Eagle series. �����The last portion of Pogue Part II contains 15 of the most amazing Early Ten Dollar Gold pieces ever assembled, all certified by PCGS and seven of them are the finest known. The stand out of the $10 Gold coins is sure to be the Garrett 1795 13 Leaves Capped Bust $10 Gold in PCGS MS66+. While the 9 Leaves variety is rarer, the one in this sale grades PCGS MS63+, which is still the finest known in a private collection. Here are a few of the other highlights from the $10 Gold series. �����Many of our prices for these amazing coins are out of date because of a lack of trades for many years, and some other dates have no listed value, so it is rather difficult to guess the final results. But once the sale is over and you have a copy of the catalogue with prices realized, history will be in your hands. The high bidders in the Pogue Collection Part II will place these coins in collections as the foundation and center pieces for future great auctions to come.